The club’s players have been unfairly criticised over their part in Claudio Ranieri’s downfall, said the two-goal hero. JAMIE VARDY FELT Leicester City provided the perfect response to the criticism they have faced in the wake of Claudio Ranieri’s sacking in the dominant 3-1 Premier League win over Liverpool. 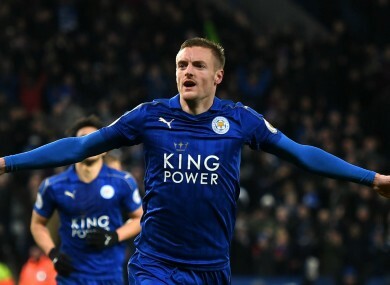 England striker Vardy scored his first top-flight goals since 10 December, either side of a spectacular Danny Drinkwater strike, to lift reigning champions Leicester out of the relegation zone four days on from Ranieri leaving the King Power Stadium. The sight of the mastermind of one of the great feats of modern football leaving the scene less than 10 months down the line left a bitter taste for many, with dressing room discontent rumoured to have played a part in the amiable Italian’s downfall. A performance reminiscent of their charge towards glory last season, as opposed to their torpid efforts this time around, did something to repair the damage, and Vardy struggled to put his finger on why he and the Foxes have struggled so much this term. “We’ve come under a lot of unfair stick with the stuff that’s been in the press and online lately,” he told Sky Sports. You’ve seen the lads wanted to put in a reaction and now it’s up to us to consistently do that. “I couldn’t tell you [why Leicester have been so poor], I couldn’t put my finger on it. I wouldn’t say [there was] more effort. Shakes [interim manager Craig Shakespeare] before the game told me to play a lot higher and there were weaknesses where we thought we could hurt them. “I’ve been very frustrated with the amount of goals I’ve got this season but hopefully those two will push me on and there are lots more to follow. Fellow goalscorer Drinkwater credited a back-to-basics approach — one that was gilded by his impeccable effort from 25 yards. “We kind of make our game on those basics — talking, moving, high pressure, high intensity. It’s about going back to basics and making it happen. We pressed them high up the pitch, it caused them problems and helped us. Email “Leicester win a reaction to bad press - Vardy”. Feedback on “Leicester win a reaction to bad press - Vardy”.